In this video, you'll learn how to populate an existing PDF form with the form submission data. IMPORTANT! You'll need a copy of the "Event Registration Form" PDF on your local workstation before starting this tutorial. You can you download this blank PDF form here. From the dashboard, mouse over the "Event Registration Form" and choose Form Design Tools > PDF Generation Tools. Choose (G) PDF Form, then click the Next button to continue. Enter 'Event Registration PDF' for the Profile Name. Click the Browse button and upload the "Event Registration Form" PDF from your local workstation. Set the value for Update Option to true. Now we need to select the field where we will save a reference to the PDF file. 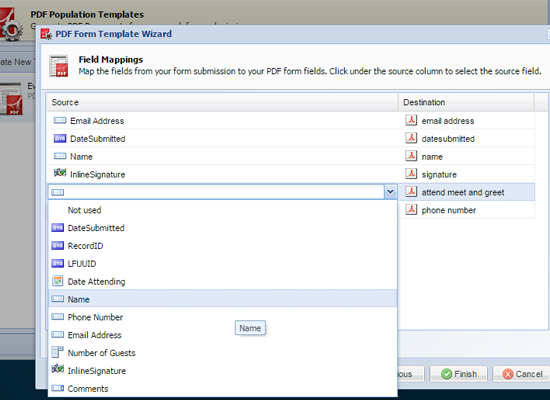 Select the Create New PDF Form Field radio button and enter 'Event PDF' for the New PDF Field Name. Next is the step is where we map the fields on our web form to our PDF. If the fields are named the same, they map automatically. The signature field and attend meet and greet field are not mapped automatically, so let's map those fields. In the Source column, click to the left of the signature field and choose InlineSignature to map the signature field. Below that field, map attend meet and greet to the Attend Meet & Greet Field? [YES] checkbox. Click the Finish button to complete the setup of the template. Now, each time the form is submitted, a new PDF will be populated with the form data and saved in the "Event PDF" field. Let's run a test submission and look at the generated PDF. Switch back to dashboard, mouse over the Event Registration Form and choose (G) Open form in a new window. After submitting the form, close the window, and from the dashboard choose Database Tools > Database Browser / Submission Bin. From within the Database view, click the filename in the far right column 'Event PDF' to view the PDF that was generated. The generated PDF will look like this example - fully populated with our form submission data. You can repeat this simple process with any PDF form to generate a fully populated PDF for each form submission.